Non-destructive testing methods are employed in various end use industries associated with metals and welds. The main purpose is to estimate the properties of the materials without damaging them. Eddy Current NDT (Non-Destructive Testing) is one among the various methods used to detect flaws or change in the properties of the materials with the help of eddy current induced in the probe that penetrates into the conductive surface of the test material and shows deflection in the equipment in case of any flaw or crack. Under Industry 4.0, which implies the fourth industrial revolution, the concept of automation of factories is mooted in such a manner that the production continues even without any kind of human intervention. The sensors and autonomous robotics technology in industries is expected to be implemented globally by the end of 2026. This has given rise to a good opportunity for the eddy current NDT equipment market as it would be impossible to monitor the robots without them. Various countries in the world are looking forward to impose stringent safety regulations in the industrial and commercial sectors. This is being done in order to avoid any kind of damage or loss to the property or life in any case. This scenario has certainly turned out to be a potential opportunity for the safety sensors market. The consumers are becoming much more aware and are adopting technologies to safeguard themselves from any kind of threat. 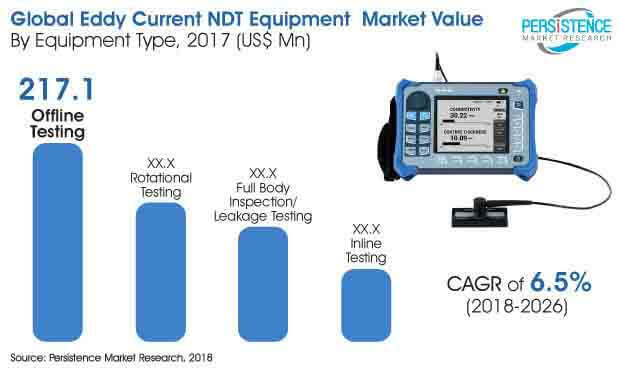 This has given rise to an opportunity to sell more safety sensors in the market has given a major thrust forward to the eddy current NDT equipment market growth. Factory automation is at its peak in North America. Not only in the United States, but also in Canada, there has been a significant growth in the quantum of factory automation. This has boost the eddy current NDT equipment market, since the process of automating a factory involves the imposition of various kinds of safety standards that are levied by the governments in North America. Along with this, the rate of production in automated factors is also high, and thus generating better revenue for the manufacturers. Also, factory automation cuts down the cost of labor wages and operates economically at a constant pace. These advantages of factory automation are also having a positive impact on the growth of the eddy current NDT equipment market in the region. One the main factor which is restraining the demand for NDT equipment is a high residual life of such kind of equipment. These equipment are designed in such manner that they have a high residual life and could last for a long time. Therefore, consumers restricts themselves to buy new equipment over a course of time which in turn becomes a major factor that restrains the demand for NDT equipment. Offline testing segment is projected to reach a market value of US$ 396.6 Mn by 2026 end. The offline testing segment was valued at US$ 217.1 Mn and is forecasted to exhibit a 6.9% CAGR during the period of assessment. Full body inspection/leakage testing equipment is projected to reach a market value of US$ 42.1 Mn by 2026 end.